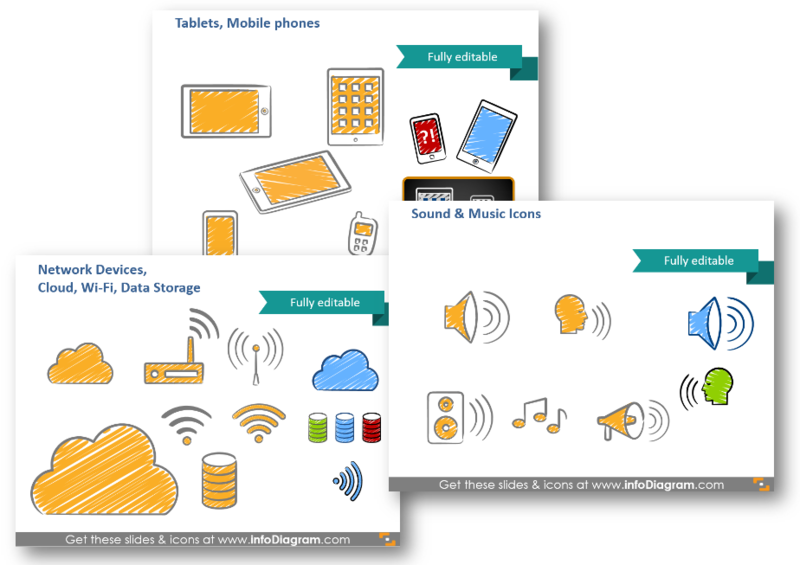 This post is an overview of scribble-style network devices clipart icons, that can easily be added to various office documents, including PowerPoint slides, Word documents, web pages or infographics. the presentation will differ from all the others. It will stand out and hence people will remember it better. the content will look more human, closer to people. Similar to the sketched notes look more appealing than printed text. you will present a personal touch to your presentation. Using icons with such handwritten style on the slides will help you to catch and keep the attention of your audience on the points you want, especially if you have to present a large amount of data or complex diagrams. Where to apply scribble IT and network devices images? You can use the scribble symbols on the diagrams and flowcharts, as an illustration of specific points. Altering the filling color can convey a further information (red and yellow for alerts and warning, green for positive messages, blue or grey for the neutral message, for example). That’s how easily you can get rid of bullet points and text boxes. If you illustrate diagram with pictograms, it will look more professional. Besides adding the icons to PowerPoint slide, you can use them also in other documents – eBooks, Excel sheets, also Keynote, Prezi and other tools. For MS Office apps a simple copy & paste of the data chart or symbols will work. For other tools (Canva, Prezi..) saving icons as an image and adding them as a picture will do the work, too. 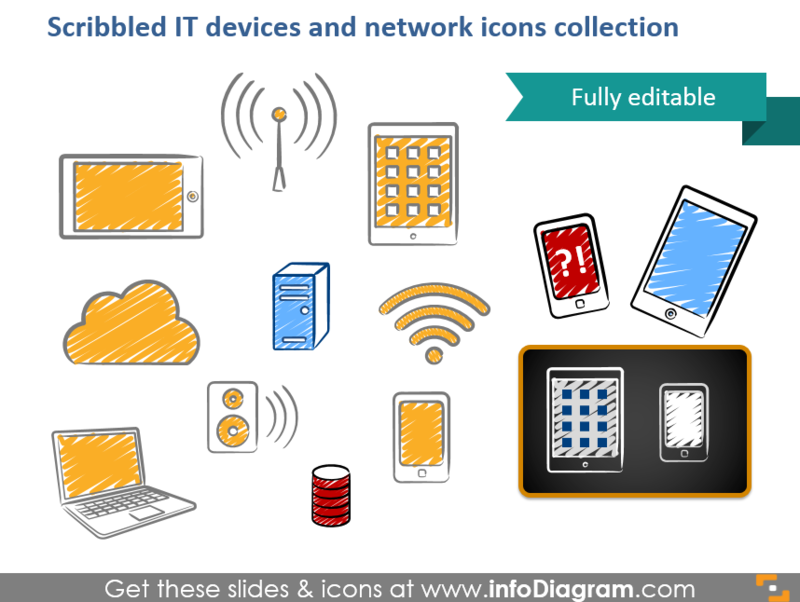 What’s inside the IT and network devices scribble icon set? 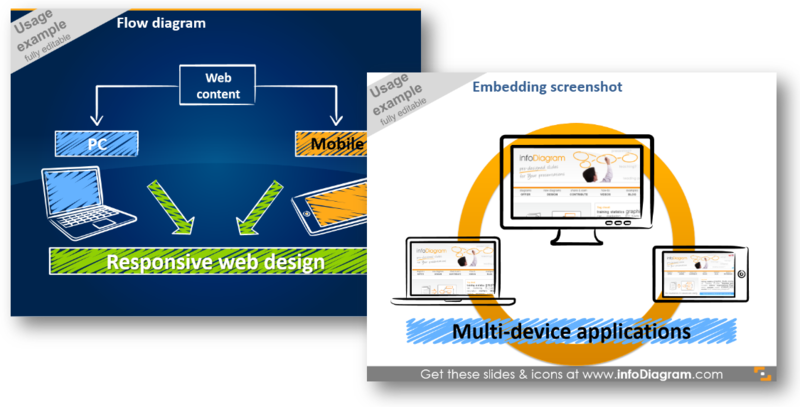 The collection contains various graphical elements for PowerPoint – scribbled tablet, smartphone, computer, network devices for diagrams. You can choose colors to correspond with your brand or the color scheme and layout of your presentation. 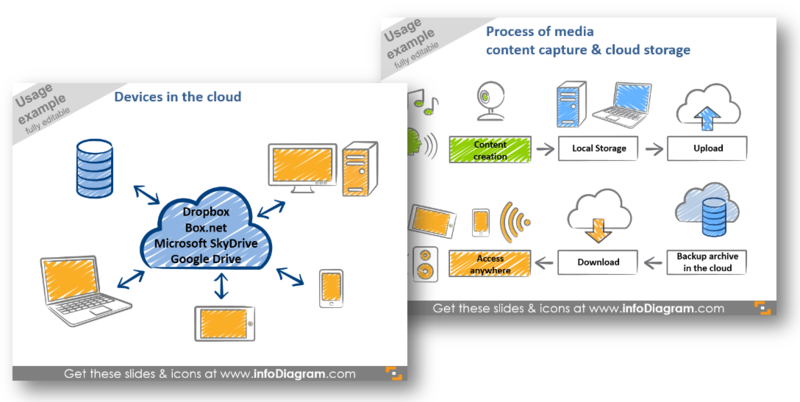 All icons and chart examples above are from our infoDiagram PowerPoint Diagrams collection. It contains IT devices and cloud icons, which can be easily edited and added to other presentation. If you like the scribble style, see the bigger complete All Scribble Symbols Bundle, with over 250 handwritten handdrawn symbols and shapes.